Oh, what you can find online. The internet offers endless possibilities if you have the cash and space in the garage. Online, you can find just about anything—good, bad, and illegal. If you’re a car enthusiast, the internet is both frightening and fun, and it often offers several examples as for why some states have mandated vehicle inspections. But once in a blue moon, you’ll stumble across something unique—a one-off creation from a backyard wunderkind with hands-on experience and no textbooks to restrain creativity. 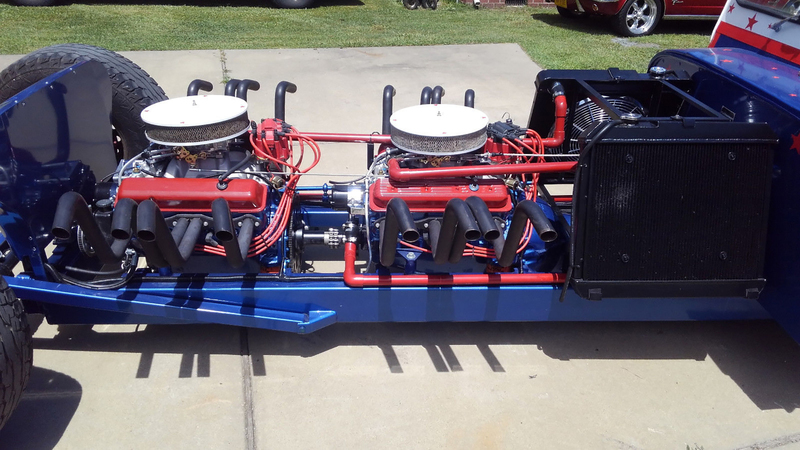 And the creation above is the very definition of creative—a postal Jeep with twin Chevy V8 engines. It’s one thing to find a rare, pristine 1963 Chevrolet Corvette Z06; it’s another thing entirely to discover something as cooky as this modified mail Jeep with two Chevy V8 engines absurdly bolted between a set of frame rails. Street legal? Maybe? The ad certainly says it is, but slick marketing is no replacement for the law. The Jeep features a custom steel tube frame measuring 17.5 feet long. It features two 355-cubic-inch, small-block Chevy V8 engines paired with a Chevy TH-400 automatic gearbox. It’s right-hand drive with power rack and pinion steering with the rear end remaining OEM. The seller claims the modified Jeep is capable of 70 mph on the highway comfortably. But before you hit the road to your next cars and coffee, remember a few internet finds are perfect. The ad listed a few minor issues that would need to be remedied before hitting the open road. The reverse lights need to be, wired and there’s no horn—both vital to a vehicle’s legality and roadworthiness. The emergency brake system needs love, too. While the sale has ended, with zero bids on a starting price of $15,000, stumbling on a gem like this is exciting. It’s fun marveling at someone else’s work like the twin Chevy V8 Jeep; however, custom builds like this often struggle to find a new home. When you build something this unique, often to your taste, finding someone who likes the same thing as you do is difficult, if not impossible.